This Brand's Handwoven Silk Sarees Are An Ode To Eternal Banaras: 5 Things We Love! Weddings, engagements and all other formal occasions, we know that nothing beats the elegance of draped silk sarees. We found Tilfi’s range of Benarasi silk sarees that are embellished in heavy brocade and with intricate work, personifying opulence. If making a trip to Varanasi isn’t on your mind, check out our 10 picks from the brand. This one’s classic Banarasi with an evergreen, floral kadhua jangla pattern, with handwoven zari. The meenakari hues against the grey base and zari vines look gorgeous! Pair this pure katan silk handloom piece with this gold brocade Banarasi borders blouse for a stunning look. Imagine yourself draped in this regal shade of turquoise! Perfect for an evening occasion, you’ll look radiant in this luxurious, vibrant and timeless Banarasi masterpiece. With gorgeous silken drape, gold and silver zari flowers and vines and an exquisite kadhua jangla weave, it’s a must in your ethnic wardrobe. Got a day engagement to go to? Be the crowd stunner in this pure soft satin silk saree in the lovely shade of coral peach with motifs of night-flowering jasmine. It’s Tanchoi weaved which means a blend of exquisite 4-colour silk fabric and no float on the back of the saree. When you want something royal but with a contemporary design, this ravishing Banarasi saree is gotta be your pick! It looks so luxurious with full-kadwa floral jangla intricately designed in meenakari, and with a breathtaking pallu. You’ll certainly want to keep it as a family heirloom. This one’s got our hearts tugged at it for its elegance and poise. Consider buying it for yourself or your Mom, it’s a treasure to add to your trousseau. The wearer will certainly be stealing the spotlight in the beautiful shade of mustard and elaborate Kadwa technique. 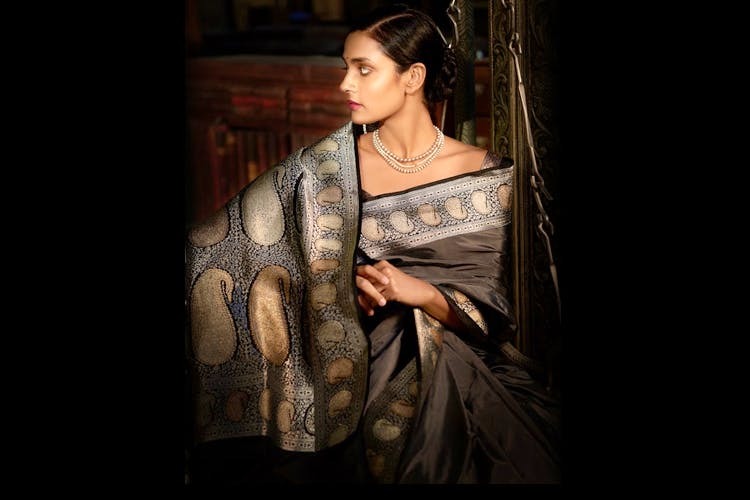 Check out the entire collection of Tilfi’s exquisite masterpieces that range across a variety of colours in pure handloom silk. Stay tuned to their updates on Facebook and Instagram.